Since Donald Trump won the recent Presidential election despite losing in the popular vote, the institution of the electoral college has been called into question. “But more people voted for Hillary, she deserves it”, or “the electoral college is totally undemocratic” are the familiar howls heard across US campuses. However, these protesters, often the whining, entitled brats who never gave Donald Trump a chance at victory, first need to accept the election’s result. And then, after a long period of easing their anger, they should at least attempt to understand the importance of the electoral college. In order to truly realize the significance of this institution, we must first go back to the late 18th century, when the United States was born. Up until this stage, America was a nation primarily composed of poor, European migrants. These people often sought refuge in America to escape the religious persecution and conflict of the old world, and thrived off individual liberties and freedom. While settlers were separated by their ethnicity, geography and culture, virtually all shared a universal distrust of government. These settler attitudes towards government, also were embraced by the founders of the United States. Part of what the founding fathers truly distrusted within a future federal government, was the scope for an.absolute majority rule (pure democracy). They feared a time in which the representatives of larger, more powerful states, could easily rule over the citizens of smaller, weaker states. To avoid this predicament, America’s founders vowed that representatives had to reflect the will of many different groups and segments of America, so that a tyrannical majority rule could be prevented. In order to hinder the potential for a repressive majority rule government, the US constitution set forward two key components. First, the number of Federal Senators allowed for each state was fixed at two. Although they wield greater influence in the House of Representatives, this ensures that every large state is eternally held to account by smaller states in the Senate. Likewise, America’s founders devised the electoral college system of voting for American Presidents, to further avoid absolute majority rule. Although it has been altered throughout the years with the addition of new states, the basic idea of the electoral college in guaranteeing minimum levels influence for smaller states, remains. Furthermore, the number of electoral votes granted to each state, remains proportional to population. California may have 55 votes, while smaller states such as Montana only have 3. Thus, contrary to some misguided conjecture, the electoral college isn’t some avenue for smaller states to undemocratically cheat out the larger ones. But the devising of the electoral college system ensures that Montana and similar states to it, have a smaller, yet present influence in Presidential elections. Larger states such as California and Texas cannot simply override smaller states through sheer numbers of votes, given the design of the electoral college. Clearly, the electoral college was designed with marked insight, and it continues to be central in ensuring that no group of people can be perennially forgotten, without genuine political ramifications. Now, back to modern opponents of the electoral college and the Democrat cry- babies. Hillary Clinton might be set to win the popular vote by millions. But before jumping to conclusions, consider a county by county map of the 2016 election. One could drive from Montana all the way to Florida (albeit carefully and with slight deviation), and not find a single county that voted for Hillary Clinton. 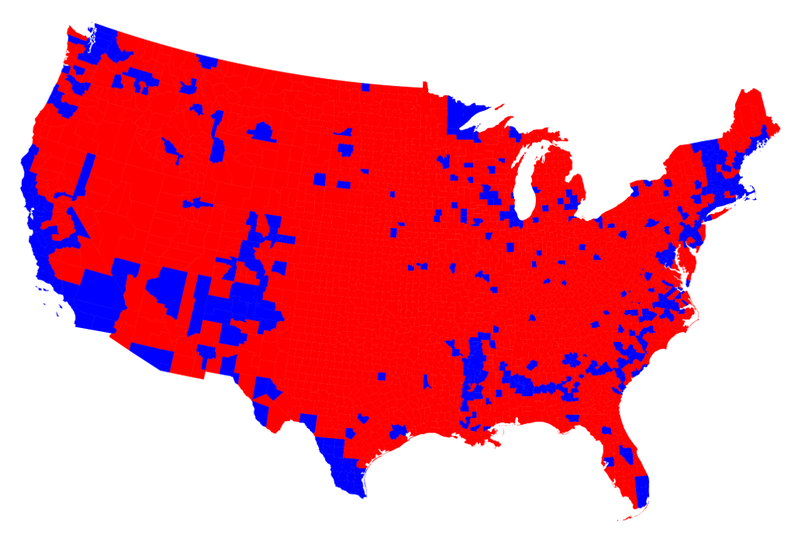 Instead, Hillary Clinton dominated coastal areas, and overwhelmingly received her support from the latte- sipping New York and San Francisco Liberal types, who were all oblivious to the concerns of Trump supporters in middle America. So would it really be fair for Hillary Clinton to be granted the Presidency based on a popular vote, while in vast swathes of America, she endured virtually no support? Of course not, and it was for elections such as these, that the electoral college was designed. All President hopefuls or would- be leaders of any country, should seek the support of voters nationwide. In the case of the 2016 election, Hillary Clinton could not achieve this, and fundamentally it was for this reason that she lost the election. Democrats would do well to pay attention to the concerns of middle America, where they have been completely wiped out. Instead, they are lobbying the federal government to remove the electoral college and in doing so, reinforce their party’s association with elitist, cavalier attitudes, that saw them lose the last Presidential election. Of course, people have a right to feel uneased about the Presidential election results, and be concerned about what the future may hold. But knee- jerk reactions such as demanding the electoral college be abolished, underestimates both the value of this institution and the implications this precedent would set, for the possible uprooting of the representative structure within the US senate. So would it really be fair for Hillary Clinton to be granted the Presidency based on a popular vote, there in lies the need to have a simple majority. The need to have smaller states inclusion as a must have is a mute point. If everyone who chooses to vote in a small state does then thier vote counts. If the smaller state goes against the popular candidate, so be it, that means the needs of that state need to be addressed at another level. Electoral college is not needed. In order for every vote to count, it should be removed. I think that would open the doors to a great deal of electoral fraud.